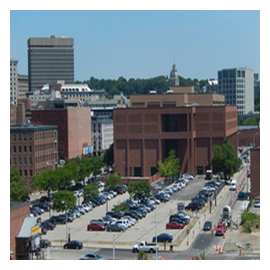 The Rhode Island Convention Center Authority engaged Keough Construction Management to be the Owners Project Manager for the new multi-level parking garage adjacent to the Garrahy Judicial Courthouse in downtown Providence, RI. The authority’s board and the General Assembly of the State of Rhode issued $43 million in bonds for the construction of a multi-level garage at the Garrahy Judicial Complex.. The quasi-public agency operates the Rhode Island Convention Center parking garages. A seven-level garage with 1,250 parking spaces and room for ground-floor shops. The report suggests the ground-floor space could be used as a RIPTA bus hub. The transformation of the current surface parking lot at the Garrahy Courthouse into a structured parking garage represents a unique opportunity to address current parking capacity deficiencies and provide a mechanism to promote economic development through highest and best use development of the nearby LINK parcels, the report states. The Garrahy site was found to offer distinct benefits as a public parking facility to serve both existing demand as well as other important redevelopment opportunities nearby.